T&E Tools 29 Piece Magna-Driver Bit Set includes Gear-Less Infinity Movement Ratchet Manga-Driver.Contains The Following 1/4" Hex Bits: Phillips: #0, #1, #2, #3. Pozidriv: #1, #2, #3. Robinson: #1, #2, #3 (Square). Slotted: 1/8", 5/32", 3/16", 7/32", 1/4". Hexagon: 5/64", 3/32", 7/64", 1/8", 9/64". 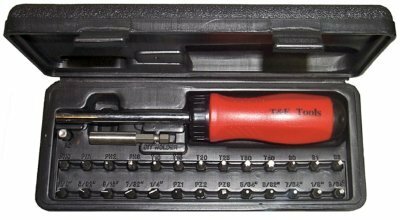 Torx-r: T10, T15, T20, T25, T30, T40. 1/4" Hex x 1/4" Drive Adaptor. 1/4" Hex Bit Extension. Gearless 3-Way Magna-Driver. Supplied in a blow mold case.